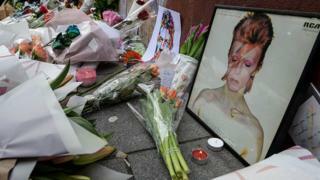 It's been held up as a particularly gloomy year for celebrity deaths. But has the grim reaper really claimed the souls of more notable people than usual in 2016? For their admirers, 2016 has been a sad year. Back in April, the BBC's Obituaries Editor Nick Serpell was tasked with checking if there was anything unusual about the number of well-known people dying, as many on social media had been claiming. He counted the number of pre-prepared BBC obituaries that ran across radio, TV and online from January until the end of March for the years 2012-16. And at that point he found that, yes, just looking at the first three months of the year, there had been a huge increase. Twice as many notable people had died in this period of 2016 compared to the same period in 2015, and five times as many as in 2012. It's worth bearing in mind that this is quite a crude way of measuring celebrity deaths. The BBC doesn't do an obituary for every celebrity that dies and, as already noted, Serpell only counted pre-prepared obituaries, rather than obituaries written after the event, or news reports that mention someone has died. Then there's also the question of who even counts as a celebrity in the first place. US television personality David Gest, for example, did not get a BBC obituary. Nonetheless, as the year draws to a close, it seems an appropriate time to ask - has 2016 continued to be so dangerous and fateful for famous people? Across the whole year, there was just over a 50% increase in BBC pre-prepared obituaries used in 2016 compared with 2015. "In 2012, we had a total of 16," says Serpell. "In 2013, it went to 24. In 2014, it rose again to 29. In 2015, it rose slightly again to 32." For 2016, as of 30 December, it stands at 49. "Just under half those deaths occurred in the first three months of the year," says Serpell. The rest of the year looked like it was settling back down to be on a par with 2015. However, there was yet another spike of notable deaths over the Christmas period when seven more people died within a two-week period. So 2016 has seen the largest number of famous people die, but it was those bumps at the beginning and the end of the year that made it so unusual. Although there does seem to have been an inexorable rise, Serpell says there hasn't been any change in the BBC's policy on what sort of person qualifies for an obituary. He thinks that the increase isn't particularly surprising, because we're now half a century on from the flourishing of both TV and pop culture in the 1960s, which massively expanded the overall pool of public figures. You're going to have to get used to hearing the celebrity obituary. This article was initially published on 16 December and had been updated to reflect subsequent deaths.